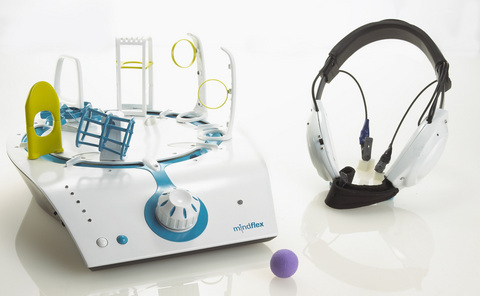 Mattel are due to launch Mindflex, a mind control game. The game consists of a sponge ball that you levitate by concentrating (and pulling a seated straining face). The ball floats by means of a fan and you can control the height by the power of your strain. Twisting a dial moves the ball around the customizable circular course, then use your mind to move it up and down to navigate through the various obstacles. It’s cool in a simple different kind of way though I’m not sure if it has any longevity and you do look a bit of a dork having to wear a head band and crocodile clips on your ears (I don’t think anybody took a picture when I had a play). Mindflex is due to market the Fall of 2009 and will retail for ~$80. I had seen this thing on t.v last year during christmas time on a shopping channel and i seen this guy use it and it looks so cool!